The "Today" show's new state-of-the-art set. NBC's "Today" show Monday debuted a new look from the brand new set at Rockefeller Center. The new set at Studio 1A boasts high definition monitors, energy-saving LED lights, and a floor that rotates 360 degrees. "It even has a new set smell we love so much," said co-host Savannah Gurthrie. The state-of-the-art features are dressed up with designer furniture with the show's trademark warm orange hues to help viewers feel like they're right at home. "A lot of people see the 'Today' show as an extension of their family," executive producer Don Nash said in the run-up to the big unveiling. "It's one of the things we try to capture." Home of the new anchor desk, which sits on a turntable that can rotate 360 degrees, allowing the hosts to look out into the plaza crowd. 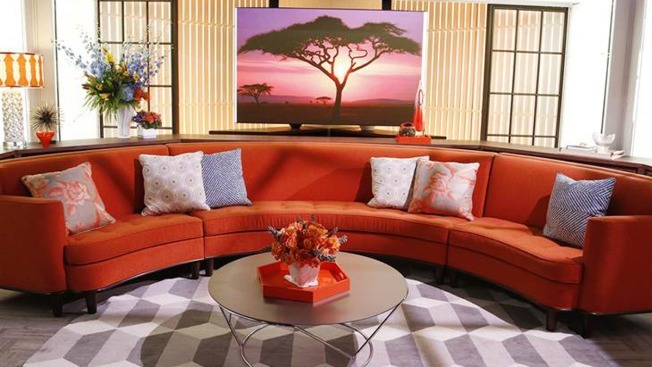 To further enhance the show's relationship with its viewers, the producers created an interactive "Orange Room," where new host Carson Daly will help the show's anchors connect to its television and social media audience. On Monday's show, Daly dove in the debate surrounding whether the Washington Redskins should change their name. Set of the new Orange Room, an new interactive feature for anchors and viewers to connect. The show's re-design also comes with a sunny new logo, an shiny orange sunrise unveiled last week to match the show's new furniture. The set re-design was spearheaded by designer Jeremy Conway, who led a team of nearly 200 people that brought his vision to life in a mere 30 days.